This is a new on-going series that if you missed the explanation of yesterday, you can click here to find out what’s going on. Photo From December 11th, 2012: Phil and Karen Luciano in their garage. A lot of you know Phil Luciano from his column and writing in the Peoria Journal Star. Not as many of you know his pretty wife, Karen Luciano. They’re both very nice people and they have a most interesting garage complete with a stocked fridge, a working eight track player, vintage beer cans, a KISS Army membership certificate and most importantly, the Bowl-Mor Bear! That last artifact is a memory from my youth and it was cool to see it in person again! The Blog Title And Link: Phil And Karen Luciano...House Call! I actually went and did the story and photos for this post a week before the blog went live. This gave me a little lead time for the start-up of the blog. This was something I was going to try and make a series out of but I only ended up doing this idea a couple of times. I still think it’s a good idea to go to someone’s house and see what sort of collections and unique things they have inside and in this case in the garage, but for some reason I never ended up pursuing this idea too many times and it never became an actual series through the years. This was a fun day and I thought since most people in Peoria know who Phil is, they might get a kick out of seeing where he lives and seeing him with his wife. 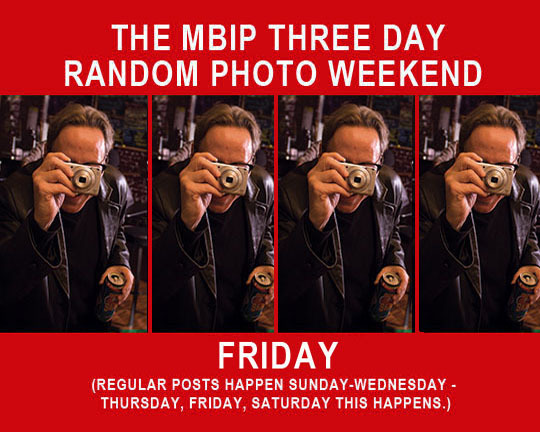 I felt this was a good way to start off MBIP with a nice local angle and the numbers of hits stayed pretty much the same as the first day so that was a relief. For the first year I really sweated the number of people looking at the blog because I had a fear of losing the audience. This would be an on-going fear that would last for years! Related Post: Three Day Weekend: December 10, 2012.